My friend Allison from Crafty Mother Of 2 made this cute Coffee Filter Christmas Tree Centerpiece for her blog the other day, and she was awesome enough to let me share the tutorial here. I love that this is literally one of the cheapest decoration ideas I have seen this season, but mostly how simple it is to put together! Allison is great with crafts, and especially frugal ones. This simple Christmas tree decor idea is a great example of her talent, and I am excited she was willing to let me share it here with you! You’ll only need few items to make this coffee filter Christmas tree, most of which you likely already have on hand in your pantry or home. I love that this is so inexpensive and easy to make! Cut out the shape of your trees from the card stock. You can use one of these two printable templates (A or B) as a guide. Begin shaping your trees with the card stock. You’ll want to practice your shape, then add glue to the edges and overlap to seal. The clamp or clothespin can hold that in place until the glue sets. Once they dry, you’ll want to trim them down so you have a tall, medium and short one. 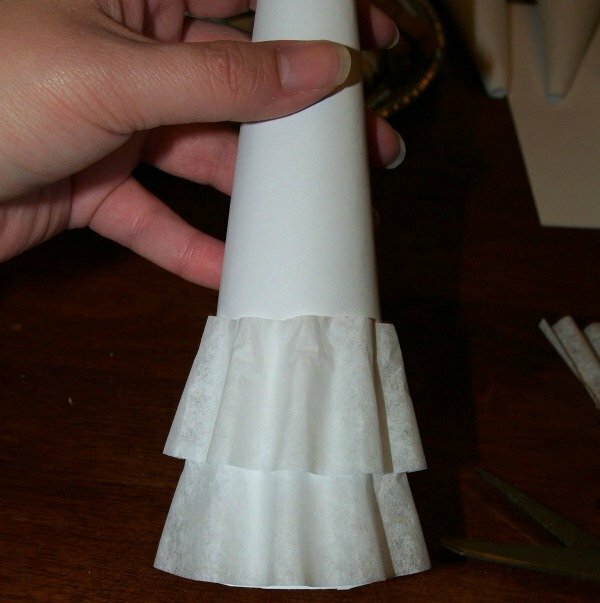 Cut the bottoms off of the coffee filters so they easily slide over your tree shape. Next, you will glue the top part of the coffee filter to your tree working your way from the bottom up. Start at the bottom to glue down one edge and wrap it around the back and glue down. You can cut off excess on the bottom as needed. You’ll want to leave them a bit loose and flowy, but secure on the back side. As you move up the tree, you will overlap the coffee filters creating a flowing tree look. 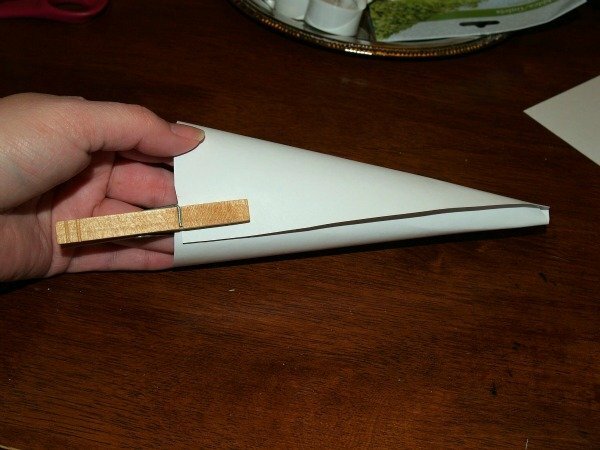 You can do this as tight or loose as you prefer, and use the clothespin to hold in place if you want to make adjustments before gluing. 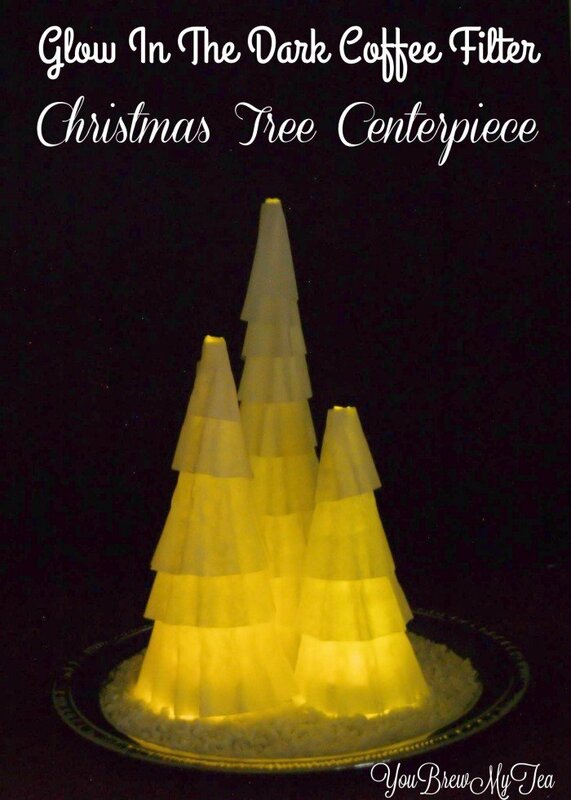 Place your tealights on the tray and top them with the coffee filter Christmas tree. In the dark, you can switch the LED candles on and have a beautiful glowing coffee filter Christmas tree centerpiece that costs under $5 to make. You can add pebbles, pinecones, or tinsel around the tray as filler for display throughout the holidays. 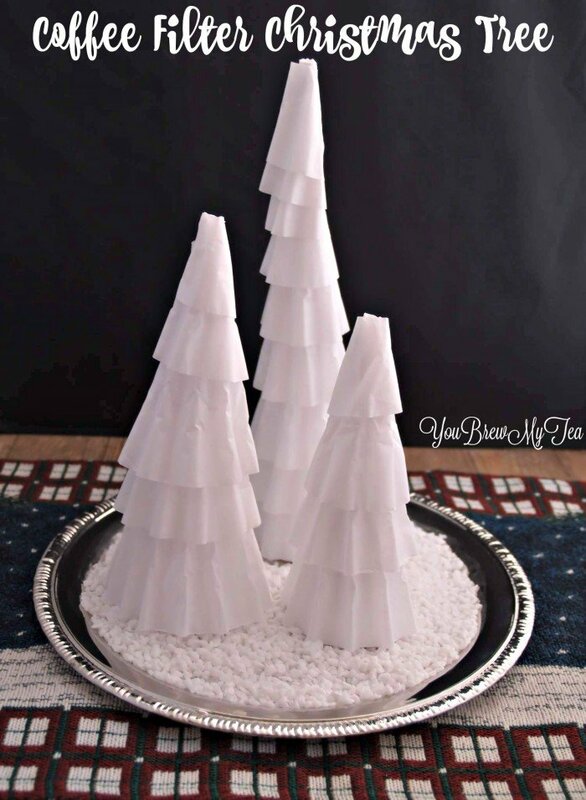 I love how simple and cute this Coffee Filter Christmas Tree is! You could easily spray paint the filters green and add small drops of paint for ornaments that would make it look like a real tree during the day, then glowing at night! Check out some of our other favorite Christmas crafts below!